UPDATE November 8, 2018: This mayo615 post from October 2016, discusses the legal complexities of a potential espionage or conspiracy charge against Julian Assange by the United States. As of now, November 2018, the indictment and extradition of Julian Assange to the United States seems highly likely. My reading that such a charge was likely and possibly imminent, is now probably becoming fact. Ecuador’s newly elected government is tired of providing Assange with diplomatic protection. 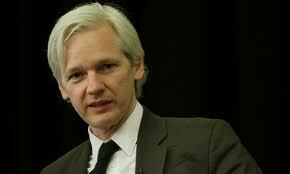 Ecuador is likely to happily give up Assange and cause his extradition to the United States by Great Britain. The increased likelihood of moving against Assange was originally heightened by numerous factors: Obama’s announcement on October 7th 2016 that the United States officially holds Russia responsible for the cyber theft of the Democratic National Committee documents released by Wikileaks, and Assange’s own statements of his intent to harm the United States, most recently in a video interview on Real Time With Bill Maher, which are now coming back to haunt him. If WikiLeaks founder Julian Assange ever ends up in a US courtroom, prosecutors could face an uphill struggle trying to convict him, given America’s legal safeguards for publishers, analysts say. On the other hand, over the course of Robert Mueller’s investigation, it has become much clearer that Assange was working directly with Guccifer 2.0 and probably Roger Stone, which alters the equation on his culpability. Citing fears of prosecution in the United States, Assange remains holed up at Ecuador’s embassy in London on Saturday, defying a British police order to turn himself in for extradition to Sweden. “WikiLeaks has a First Amendment argument, and it is a serious First Amendment argument if it is ever charged,” Abrams said on C-Span television in 2010.